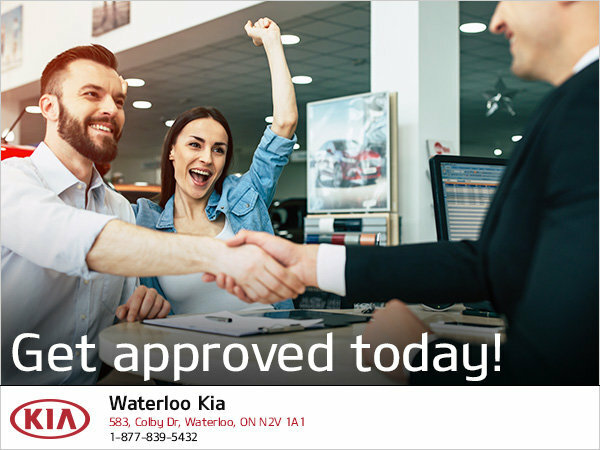 Home > Special Offers > Dealer > Get Approved for Credit Today with Waterloo Kia! At Waterloo Kia, we strive to make financing as easy and effortless as possible. When you visit our dealership, you can look forward to the best service possible. Our team of financing specialists are here for you every step of the way, and they’ll find the perfect solution for your needs. We have a wide range of flexible and affordable financing solutions designed to help you with your credit needs at Waterloo Kia. We truly strive to make sure that we get you the right financing solution for your budget. We're here to make sure you drive home satisfied, so contact us today to find out how we can help you find the best rates to suit you. Certain conditions may apply. Contact dealer for details.